Click on the thumbnails above to view examples. What should be an easy purchase can sometimes be overly confusing. 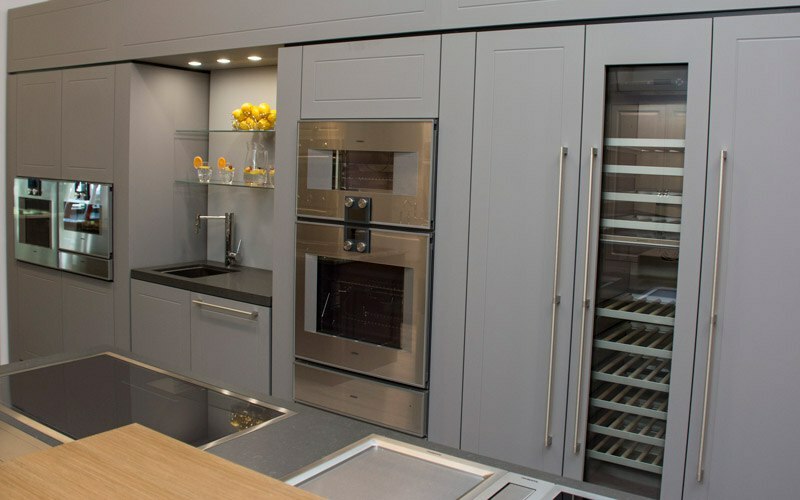 Manufacturers have added tons of features like twin convection fans, door hinging options, steam assist, smart cooking and Wi-Fi connectivity. How do you cut through the clutter? It depends on how you cook. Use the filters below to narrow down your preferences to the brands offering your perfect wall oven so you can focus on a few options when you visit our showrooms. 1. Based on your size selection you may be limited in other preference selections. 2. Based on your fuel type selection you may be limited in other preference selections. Side Swing DoorsOne large door that opens from the side. Can usually order with left or right hinge. 8. 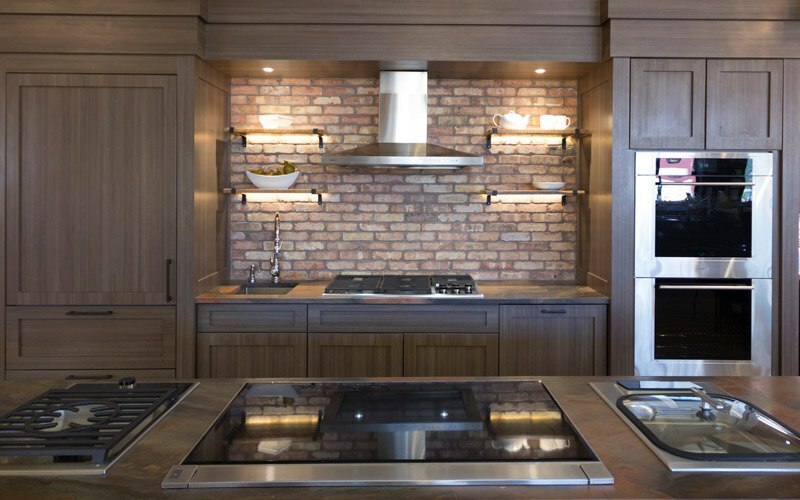 Some wall ovens have introduced steam features into the oven for caramelizing but especially baking bread. This will not include traditional steam ovens. 9. Choose if you prefer the oven to choose cooking time and temp based on your food. 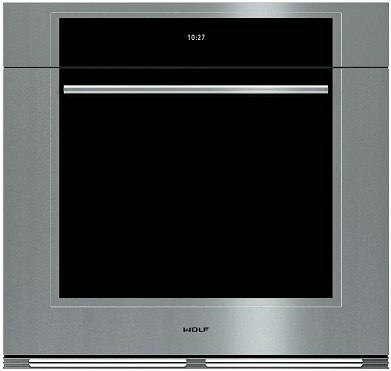 Wolf's 36-inch built-in single wall oven's sleek, contemporary design has a control panel that rotates into position when in use. When its not in use, it remains hidden behind a stainless steel panel. This oven is excellent for baking, roasting, or cooking. Its dual convection oven has 10 cooking modes for faster, even cooking. The modes are Bake, Roast, Broil, Dehydrate, Convection, Convection Roast, Convection Broil, Bake Stone, and lastly, Proof. For a better cooking experience and results, this oven also comes with a temperature probe to take the guessing out of cooking. As for cleaning, it is a self-cleaning wall oven. Image might not match your exact results. This Wolf 30-inch M series contemporary built-in double wall oven comes in a black glass, handless design with color touchscreen controls. It can be installed flush or have a standard inset. 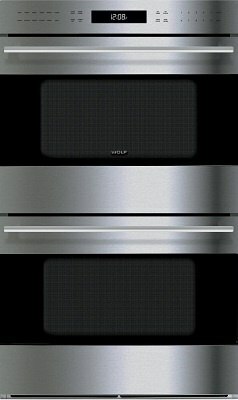 It has 10 precision cooking modes for even cooking such as Convection, Convection Roast, Dehydrate, Stone, and Gourmet. With the Gourmet mode, you have nearly 50 food presets to set the ideal cooking mode, temperature, and directs you to the perfect rack positioning. Both ovens have a capacity of 5.1 cu. ft and have dual verticoss convection, excellent for consistent heat and better cooking results. 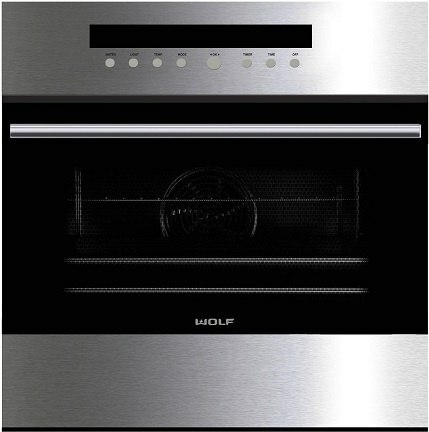 This Wolf 30-inch M series contemporary built-in single wall oven is perfect for any integrated kitchen style. It can sit flush to your cabinetry and comes in a black glass, handless design. 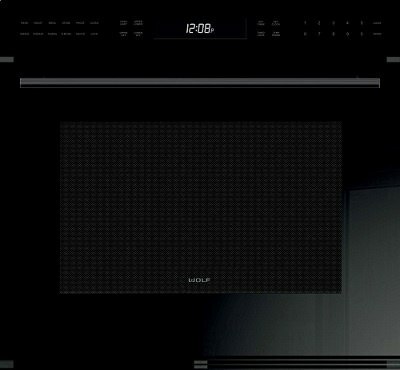 The controls are touchscreen and provide you a display for 10 precision cooking modes. 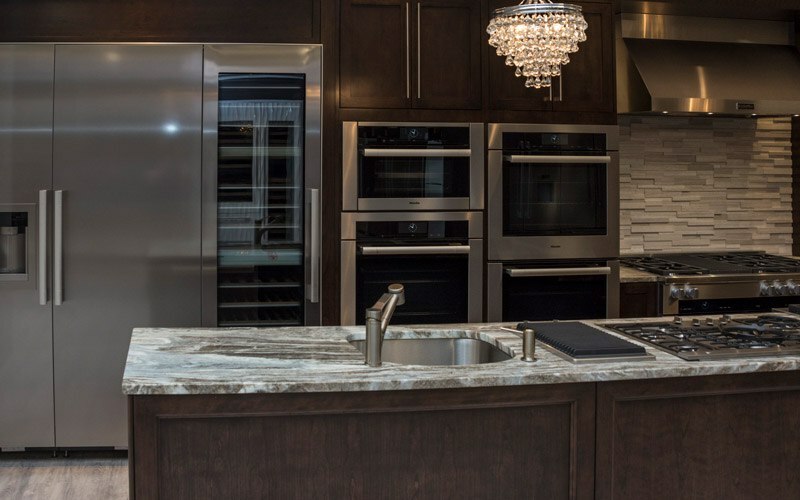 The cooking modes include Convection, Convection Roast, Broil, Dehydrate, Stone, and Gourmet. With the Gourmet mode, you have almost 50 meal presets. These presets help to make your cooking experience nearly flawless by setting the ideal temperature and mode while directing you of the perfect rack positioning for your dish. This oven is fairly large at 5.1 cu. ft capacity with dual verticoss convection for even baking. 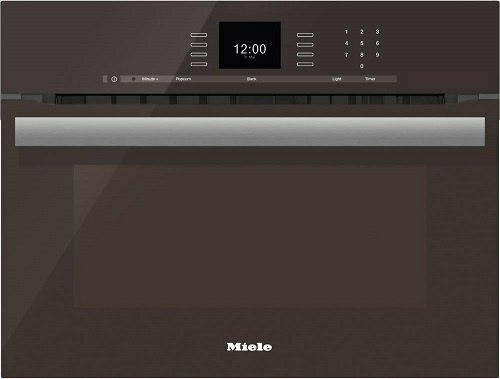 This 30-inch M Series Cotemporary Built-in Single Oven has a handleless design and touchscreen controls. This 5.1 cu. 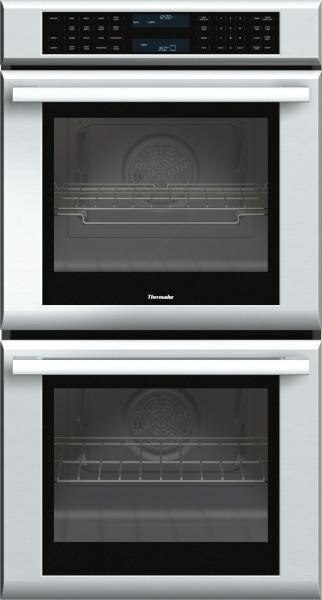 ft capacity oven has an enhanced interior view with halogen lights and a large glass window. The oven has dual verticross convection to circulate heat across all the racks for even cooking. What qualifies this oven as a true cooking tool is its 10 cooking modes for precise results. These modes include Convection, Convection Bake, Stone, Proof, Dehydrate, and Gourmet. The Gourmet mode offers almost 50 meal presets that will tell you where to position your dish, on what rack, temperature, and will select your perfect cooking mode. 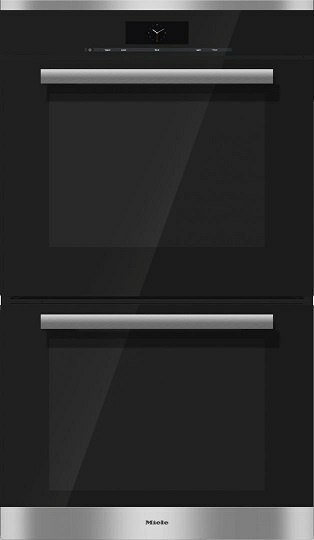 Wolf's 30-inch M Series Contemporary Built-in Double Oven has a handleless design and touchscreen controls for a sleek look. It can be set truly flush for an integrated look. With a 5.1 cu. ft oven, this is a large space. With dual verticross convection fans, heat reaches across all racks for better, even cooking results. This oven has 10 cooking modes including Gourmet - excellent for precise cooking. The Gourmet mode offers almost 50 meal presets that will tell you where to position your dish on what rack, temperature, and cooking mode. 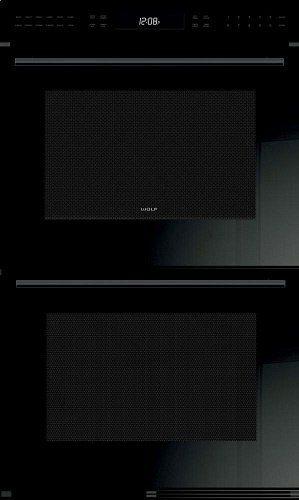 The Wolf 30-inch Series Professional Built-In Double Oven is equipped with 10 cooking modes for precise cooking. They are Convection, Bake, Roast, Broil, Convection Roast, Gourmet, Proof, Warm, Dehydrate, and Stone. Gourmet features nearly 50 presets that tell you the right rack position and will automatically adjust the temperature and cooking mode for you. With a 5.1 cu. ft. oven capacity and advanced dual verticross convection, allows you to have for faster preheats and consistent cooking. its user-friendly touchscreen controls offer a smooth design. You also have the choice of knob color. 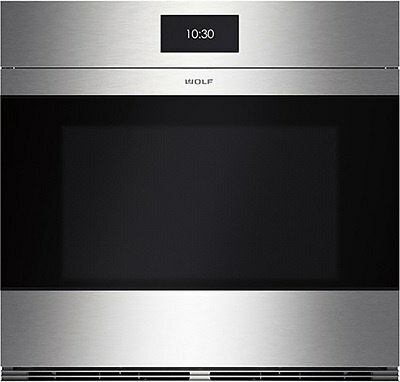 The Wolf 30-inch Series Professional Built-In Single Oven is equipped with 10 cooking modes for precise cooking. They are Convection, Bake, Roast, Broil, Convection Roast, Gourmet, Proof, Warm, Dehydrate, and Stone. Gourmet features nearly 50 presets that tell you the right rack position and will automatically adjust the temperature and cooking mode for you. With a 5.1 cu. ft. oven capacity and advanced dual verticross convection, allows you to have for faster preheats and consistent cooking. its user-friendly touchscreen controls offer a smooth design. You also have the choice of knob color. The Wolf 30-inch M Series transitional Built-In Double Wall Oven has 10 cooking modes for foolproof results including Convection, Convection Bake, Roast, Broil, Gourmet, Proof, Warm, and Dehydrate. The Gourmet mode features almost 50 meal presets to automatically control your temperature, mode, and rack positioning. You also have a clear view of your dish in the oven with halogen lights and large glass windows. Your ovens are large at 5.1 cu. ft. capacity for each oven. Each has dual verticross convection fans for perfect, even cooking. No need to rotate your pans. Not to mention, your touchscreen controls provide a user-friendly handling experience. The Wolf 30-inch M Series transitional Built-In Single Wall Oven has 10 cooking modes for foolproof results including Convection, Convection Bake, Roast, Broil, Gourmet, Proof, Warm, and Dehydrate. The Gourmet mode features almost 50 meal presets to automatically control your temperature, mode, and rack positioning. You also have a clear view of your dish in the oven with halogen lights and large glass windows. Your ovens are large at 5.1 cu. ft. capacity for each oven. each has dual verticross convection fans for perfect, even cooking. No need to rotate your pans. Not to mention, your touchscreen controls provide a user-friendly handling experience. The 24-inch E Series Transitional Built-in Single Oven is perfect for small kitchens or limited space. It has 11 cooking modes for precise results: bake, bake humid, slow cook, convection, convection humid, convection bake, broil, convection broil, gourmet, slow roast, and keep warm. Its black porcelain interior has convection heat for more consistent cooking. This oven has a 50% faster preheat time than most and is self-cleaning. It also has adjustable oven racks, a porcelain coated the pan, and a delay starts for convenience. Lastly, there are multiple design options with an optional pro handle accessory. The 30-inch Wolf E Series Pro Built-in Single Oven has dual convection and a temperature probe for faster, precise cooking results. its equipped with 10 cooking modes: bake, roast, broil, convection, convection bake, convection roast, convection broil, bake stone, proof, and dehydrate. Its interior is a porcelain cobalt blue. It also has a knack for convenience. The racks are adjustable, the oven is self-cleaning, and it has a delay start and Sabbath mode settings. At 30-inches you still have install flexibility, so it will sit flush to your cabinets. 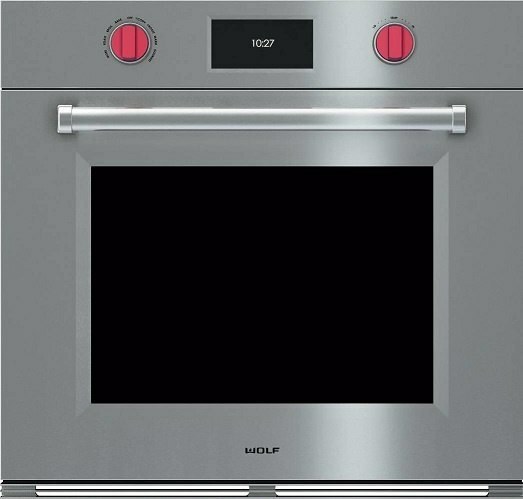 Wolf's 30-inch E Series Pro Built-in Double Oven with dual convection has 10 cooking modes: bake, roast, broil, convection, convection bake, convection roast, convection broil, bake stone, proof, and dehydrate. 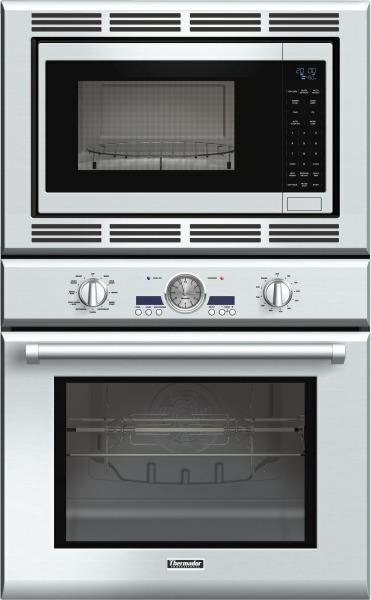 its cobalt blue porcelain interior oven has three adjustable oven racks for convenience. The recessed broil element provides more room for large dishes. It has self-clean, delay start, and Sabbath mode settings. Its hidden bake element makes it obstacle free when it comes to cleaning the oven floor. its dual fans make cooking faster while your temperature probe takes the guessing out of the mix. 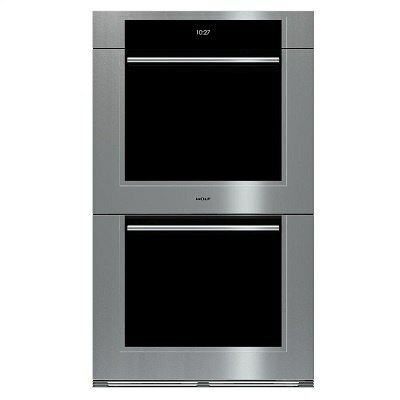 Lastly, if you have an integrated kitchen or not, this oven has install flexibility and can sit flush to your cabinets. Miele's single 30-inch convection oven is excellent for precise, easy cooking with twin convection blowers. its MasterChef programs and Special Modes help to provide superb results with a user-friendly interface. The interface is touchscreen and has a clear text display. You have over 100 easy to use programs with MasterChef that make your cooking experience effortless whether its cakes, meats, or other dishes. The oven will automatically set your temperature, mode, and duration. As for other perks, this oven is self-cleaning and has a few safety modes like appliance cooling technology to keep the exterior cool while on to prevent burns, as well as a lock system to prevent turning the oven on unintentionally. Miele's single 30-inch convection oven is available in Truffle Brown, Obsidian Black, Brilliant White, or Clear Touch Steel. its excellent for precise, easy cooking with twin convection blowers and MasterChef programs. The MasterChef Programs, including a number of Special Modes, help to provide superb results with a user-friendly interface. The interface is touchscreen and has a clear text display. You have over 100 easy to use programs with MasterChef that make your cooking experience effortless whether its cakes, meats, or other dishes. The oven will automatically set your temperature, mode, and duration. As for other perks, this oven is self-cleaning and has a few safety modes like appliance cooling technology to keep the exterior cool while on to prevent burns, as well as a lock system to prevent turning the oven on unintentionally. 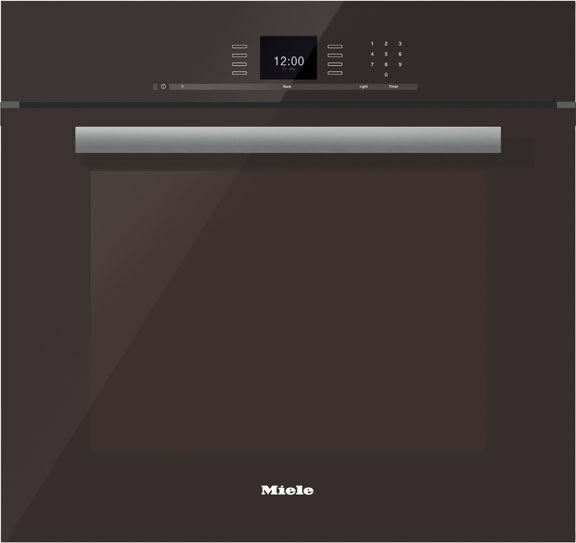 Miele's 30-inch double wall oven with convection includes their MasterChef program and a number of special modes. Miele's touchscreen control system displays these modes and programs clearly, making it easy for you to read, use, and set. With their MasterChef program, you have over 100 easy to use settings and preferences to make your cooking experience effortless. 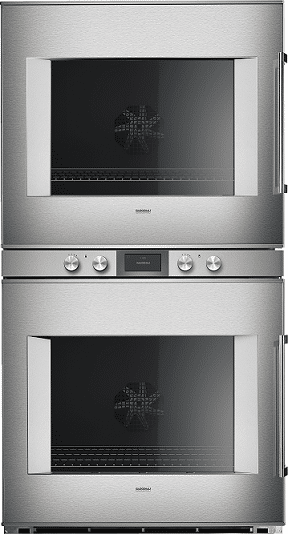 Not to mention, Miele's double wall oven has Moisture Plus, exclusive to Miele. Their Moisture Plus program adds moisture to for the best possible results. If you are roasting or baking, the moisture will ensure your dough is light and nicely browned. Miele also added a wireless temperature probe to indicate when meats or fish are cooked to perfection. As for other perks, this oven is self-cleaning and has a few safety modes like appliance cooling technology to keep the exterior cool while on to prevent burns, as well as a lock system to prevent turning the oven on unintentionally. 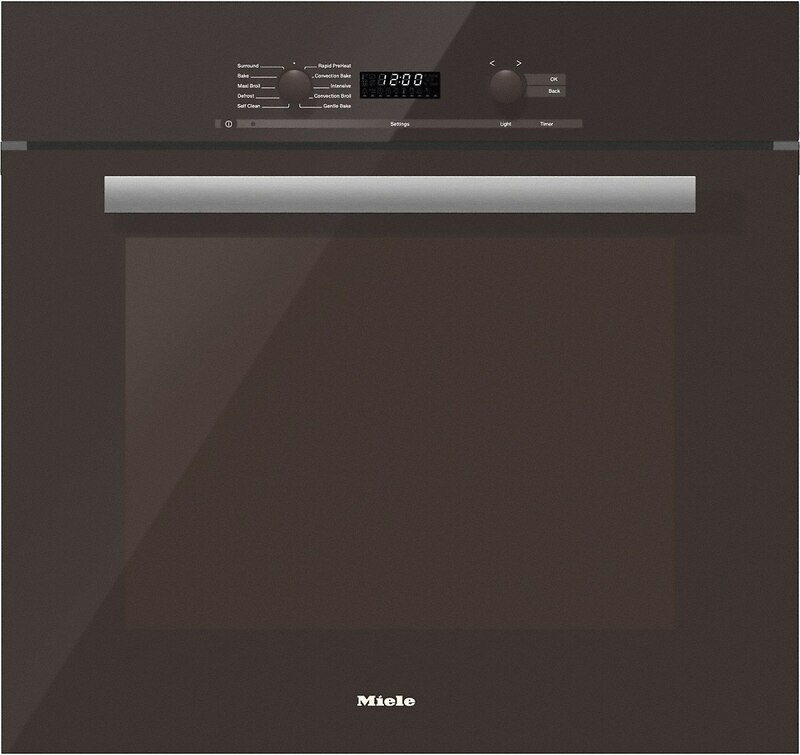 Miele's 30-inch double wall oven with convection includes their MasterChef program and a number of special modes. 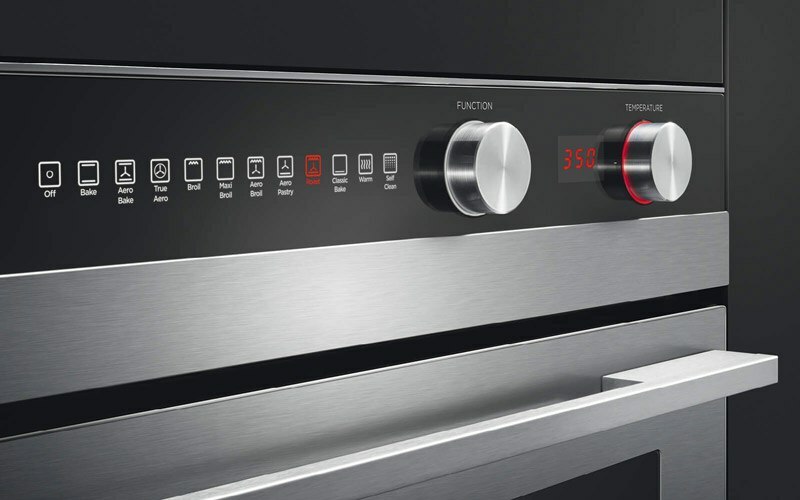 Miele's touchscreen control system displays these modes and programs clearly, making it easy for you to read, use, and set. With their MasterChef program, you have over 100 easy to use settings and preferences to make your cooking experience effortless. 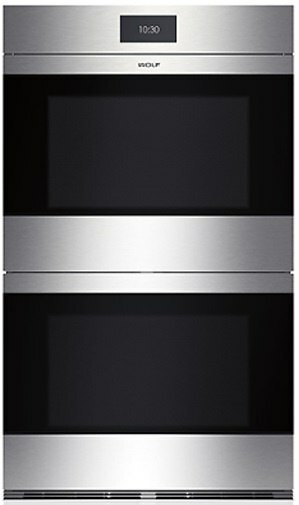 Not to mention, Miele's double wall oven has Moisture Plus, exclusive to Miele. Their Moisture Plus program adds moisture to for the best possible results. If you are roasting or baking, the moisture will ensure your dough is light and nicely browned. Miele also added a wireless temperature probe to indicate when meats or fish are cooked to perfection. As for other perks, this oven is self-cleaning and has a few safety modes like appliance cooling technology to keep the exterior cool while on to prevent burns, as well as a lock system to prevent turning the oven on unintentionally. 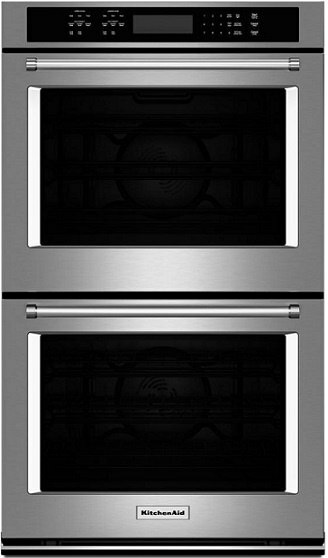 This double wall oven is available in Truffle Brown, Obsidian Black, Brilliant White, or Clear Touch Steel. 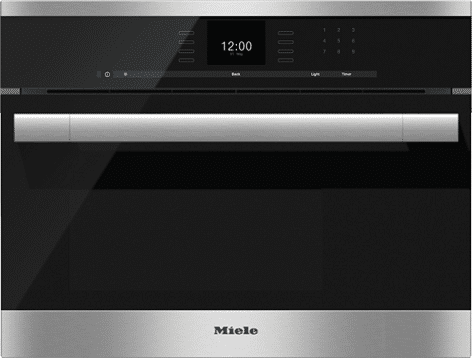 Miele's PureLine SensorTronic Series, 24-inch single electric wall oven has a 1.3 oven capacity. its smaller than a regular oven, but it comes with MultiSteam Technology. This steam oven is excellent for poultry, seafood, rice, meat, puddings, eggs, and so forth. It is an excellent addition to your kitchen, especially if you are seeking a healtheir lifestyle. It also has Miele's MasterChef Automatic Programs including steam reduction and convection options. As for setting these options, the oven has touchscreen controls that clearly display the menu, settings, and cooking modes. its interior is stainless steel and provides Interior Lighting as well as their ClearView door. 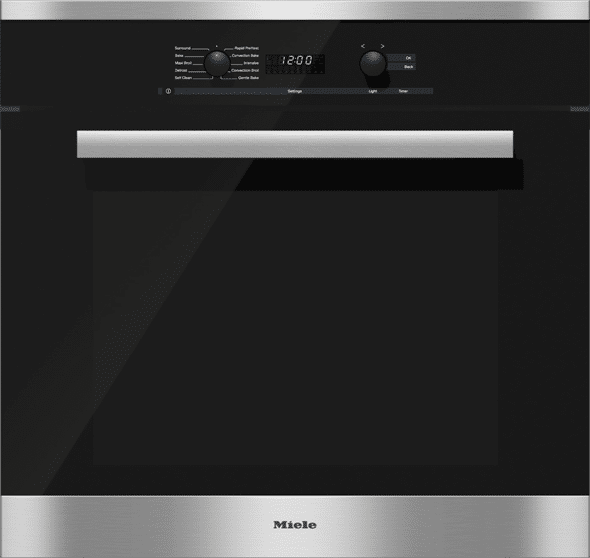 Miele's PureLine SensorTronic Series, 24-inch single electric wall oven has a 1.3 oven capacity. its smaller than a regular oven, but it comes with MultiSteam Technology. This steam oven is excellent for poultry, seafood, rice, meat, puddings, eggs, and so forth. It is an excellent addition to your kitchen, especially if you are seeking a healtheir lifestyle. It also has Miele's MasterChef Automatic Programs including steam reduction and convection options. As for setting these options, the oven has touchscreen controls that clearly display the menu, settings, and cooking modes. its interior is stainless steel and provides Interior Lighting as well as their ClearView door. 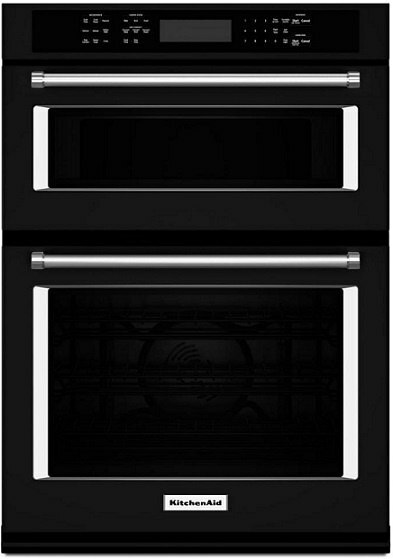 This oven is available in obsidian black, truffle brown, or brilliant white to match your kitchen design. 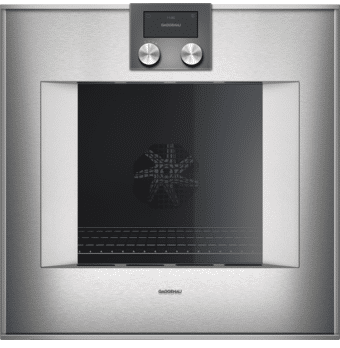 Miele's SensorTronic 30-inch single wall oven has a 4.6 cu. ft. oven capacity. With TwinPower fans, this convection oven cooks your food evenly and with their roast and temperature probe, you can master precision cooking. Not only does this oven feature their MasterChef menu, you can also add up to 20 recipes as your preferred "favorites." The controls make your menu and settings easy to adjust and they are clearly visible. As for cleaning this oven, this oven makes it easy. This oven has an efficient self-cleaning program that will reduce food particles to ash that you can effortlessly wipe away. 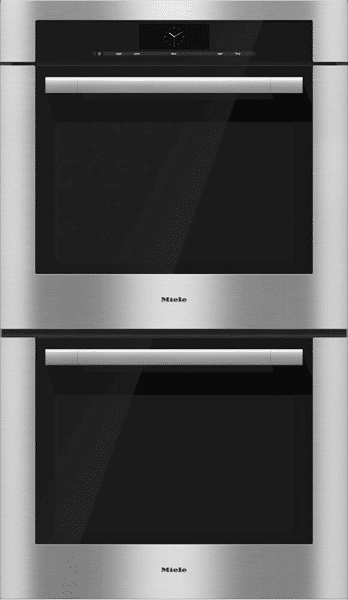 Miele's SensorTronic 30-inch single wall oven has a 4.6 cu. ft. oven capacity. With TwinPower fans, this convection oven cooks your food evenly and with their roast and temperature probe, you can master precision cooking. Not only does this oven feature their MasterChef menu, you can also add up to 20 recipes as your preferred "favorites." The controls make your menu and settings easy to adjust and they are clearly visible. As for cleaning this oven, this oven makes it easy. This oven has an efficient self-cleaning program that will reduce food particles to ash that you can effortlessly wipe away. This integrated oven has the option of coming in obsidian black, truffle brown, or brilliant white to match any style of your kitchen. 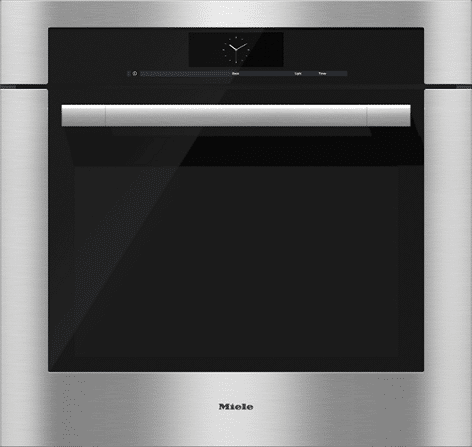 Miele's 30-inch single electric wall oven features their DirectSelect Controls, a turn dial operation. This 4.6 cu. ft. oven capacity, convection oven has 8 operating modes including an intensive mode to gently circulate heated air for better, more even cooking, as well as creating a "brick oven" environment with its TwinPower fans. Think brick-oven pizza. 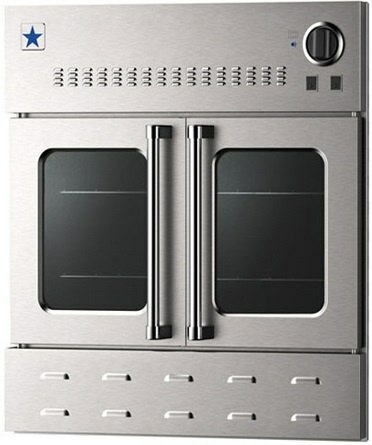 As for design this oven features their CleanGass door and is a fine stainless steel. Lastly, its self-cleaning for easy maintenance. 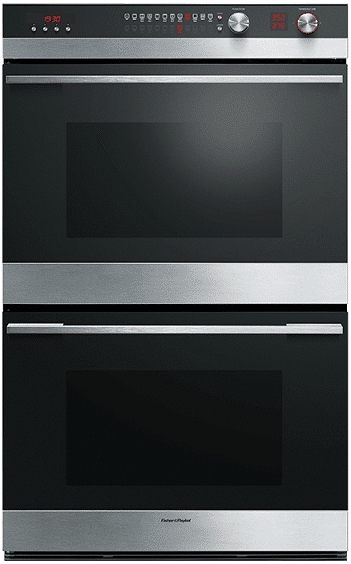 Miele's 30-inch single electric wall oven features their DirectSelect Controls, a turn dial operation. This 4.6 cu. ft. oven capacity, convection oven has 8 operating modes including an intensive mode to gently circulate heated air for better, more even cooking, as well as creating a "brick oven" environment with its TwinPower fans. Think brick oven pizza. 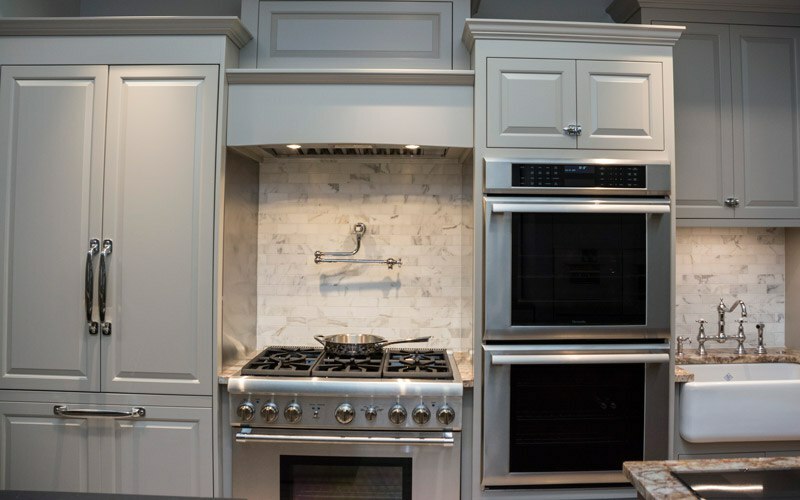 As for design this oven features their CleanGass door and can come in in obsidian black, truffle brown, or brilliant white to match any kitchen style. Lastly, its self-cleaning for easy maintenance. 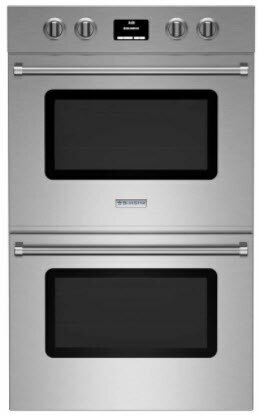 Thermador's Masterpiece, 27-inch single electric wall oven features their True Convection system for even cooking results and no flavor transfer. Their oven has a capacity of 4.2 cu. ft. with 2 full access telescopic racks and six adjustable positions, awesome for cooking multiple dishes. You also have 13 cooking modes and 20 pre-programmed recipes. For convenience, Thermador's luxury segment has a 7 minute preheat time, or with their speed convection mode, there is no preheat needed. Now with their advanced culinary modes including Warm, Proof, and Dehydrate, you can make dried fruit or proof your dough before making a flatbread. For maintenance, this oven features a 2-hour self-clean. its also new and improved as Star-K certified. 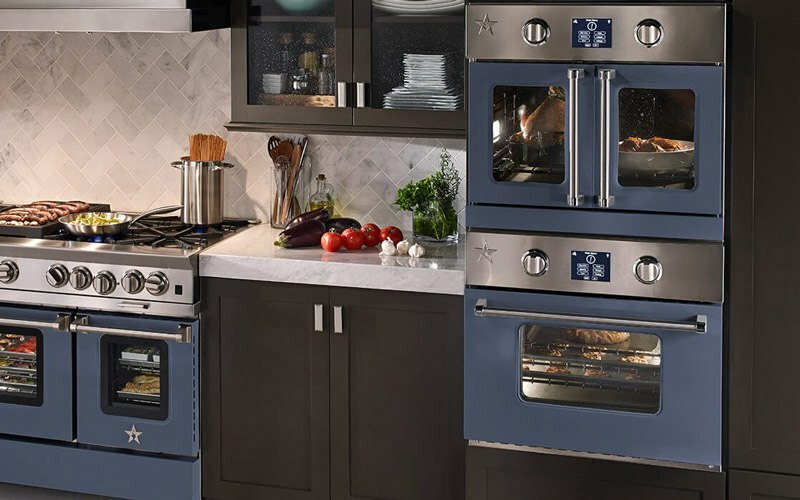 Thermador's Masterpiece, 30-inch single electric wall oven features their True Convection system for even cooking results and no flavor transfer. Their oven has a capacity of 4.7 cu. ft. with 2 full access telescopic racks and six adjustable positions, awesome for cooking multiple dishes. You also have 13 cooking modes and with EasyCook, 20 pre-programmed recipes. For convenience, Thermador's luxury segment has a 7 minute preheat time, or with their speed convection mode, there is no preheat needed. The fast preheat system is available for 5 cooking modes. Now with their advanced culinary modes including Warm, Proof, and Dehydrate, you can make dried fruit or proof your dough before making a flatbread. For maintenance, this oven features a 2-hour self-clean. its also new and improved as Star-K certified. 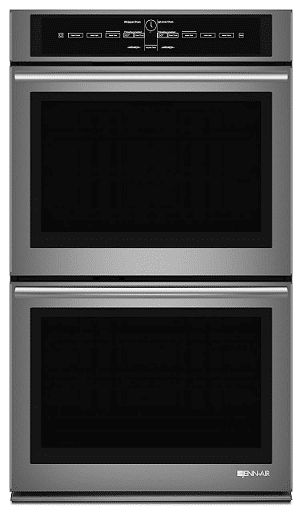 Thermador's Masterpiece, 27-inch double electric wall oven features their True Convection system for even cooking results and no flavor transfer. Each oven has a capacity of 4.2 cu. ft. with 2 full access telescopic racks and six adjustable positions, awesome for cooking multiple dishes. You also have 13 cooking modes and 20 pre-programmed recipes. For convenience, Thermador's luxury segment has a 7 minute preheat time, or with their speed convection mode, there is no preheat needed. Now with their advanced culinary modes including Warm, Proof, and Dehydrate, you can make dried fruit or proof your dough before making a flatbread. For maintenance, this oven features a 2-hour self-clean. its also new and improved as Star-K certified. 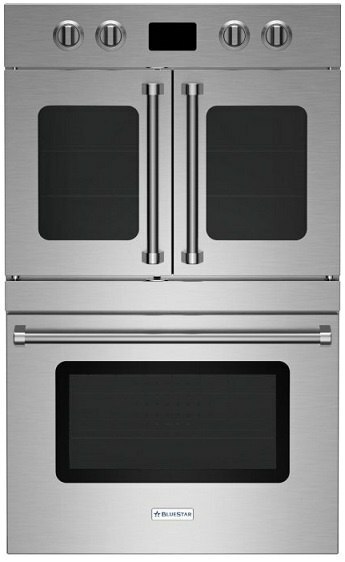 Thermador's Masterpiece, 30-inch double electric wall oven features their True Convection system for even cooking results and no flavor transfer. Each oven has a capacity of 4.7 cu. ft. with 2 full access telescopic racks and six adjustable positions, awesome for cooking multiple dishes. You also have 13 cooking modes and with EasyCook, 20 pre-programmed recipes. For convenience, Thermador's luxury segment has a 7 minute preheat time, or with their speed convection mode, there is no preheat needed. The fast preheat system is available for 5 cooking modes. Now with their advanced culinary modes including Warm, Proof, and Dehydrate, you can make dried fruit or proof your dough before making a flatbread. For maintenance, this oven features a 2-hour self-clean. its also new and improved as Star-K certified. 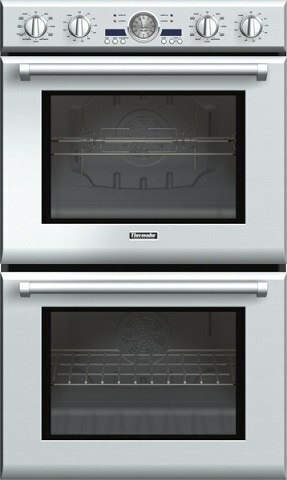 Thermador's 30-inch combination wall oven is the best of both worlds for baking, cooking, reheating, or defrosting. You have a 4.7 cu. 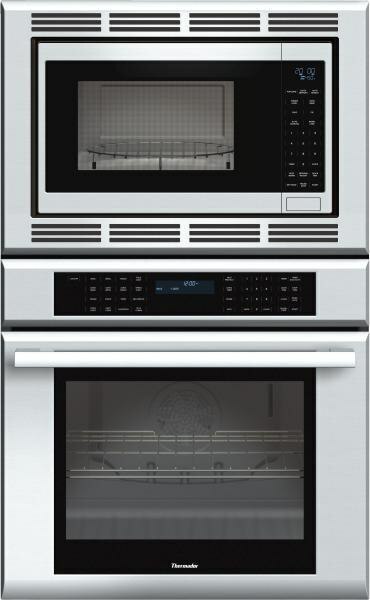 ft. true convection wall oven for gourmet results and a 1.5 cu ft. convection microwave. With 13 cooking modes and advanced culinary modes such as warm, proof, and dehydrate, you can meet all your cooking needs. Not to mention, you can take the guessing out of cooking with their CookControl temperature probe to measure when your food, such as meat, is done. The convetion wall oven has 2 full access telescopic racks that hold up to 45 pounds and feature integrated easy-grip handles and 6 adjustable rack positions. For convenience, you have an automatic delay start mode with a timer. Lastly, this oven is now Star-K certified. 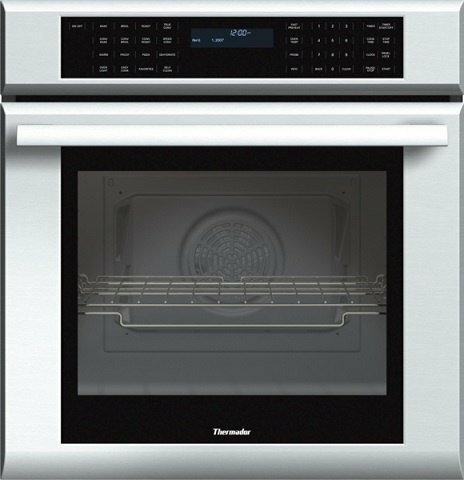 Thermador's Professional Series 30-inch single wall oven helps you achieve gourmet cooking results with their True Convection fans and CookControl temperature probe. The temperature probe tells you when your food, such as meat, is done for precise cooking results. This oven has a capacity of 4.7 cu. ft. and features 14 cooking modes, such as warm, dehydrate, and proof, with a fast preheat available for 5 of them. Not to mention this oven features their MaxiBroil, their largest, most powerful broil element. This professional wall oven also features a commercial style rotisserie that can hold up to 12 pounds, 3 telescopic racks that can hold up to 45 pounds, and seven adjustable rack levels for multiple dishes. Lastly, this oven is Star-K certified and features a 2-hour self-clean for efficiency. Thermador's Professional Series 30-inch double wall oven helps you achieve gourmet cooking results with their True Convection fans and CookControl temperature probe. The temperature probe tells you when your food, such as meat, is done for precise cooking results. Each oven has a capacity of 4.7 cu. ft. and feature 14 cooking modes, such as warm, dehydrate, and proof, with a fast preheat available for 5 of them. Not to mention this oven features their MaxiBroil, their largest, most powerful broil element. This professional wall oven also features a commercial style rotisserie that can hold up to 12 pounds, 3 telescopic racks that can hold up to 45 pounds, and seven adjustable rack levels for multiple dishes. Lastly, this oven is Star-K certified and features a 2-hour self-clean for efficiency.  A description of this product or brand and any other important information that may be useful to the user. Explain the benefits and what it offers, and take into consideration that this is showing based on the features they're looking for. 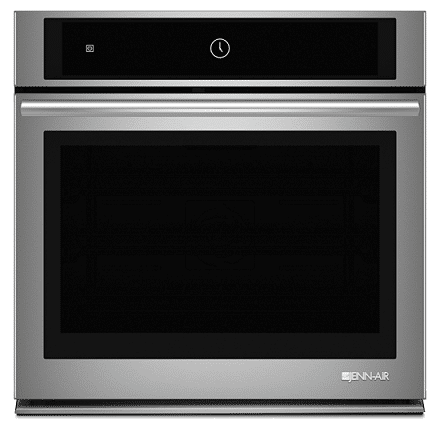 Jenn-Airs 30-inch single oven with V2, their Vertical Dual-Fan Convection System is perfect for any household. It has a large 5.0 cu. ft. oven capacity with Wi-Fi connectivity and a 7-inch full-color touchscreen display. Their controls show you images of the food to help you select the correct program, doneness levels, and pan types to help you choose the right setting. This is all part of their Culinary Center program that customizes each cooking cycle based on your preferences. Since this iis a convection oven, your convection functions include bake, broil, and roast. durafinish protection keeps it from staining, convection functions include bake, broil, roast. Jenn-Airs 30-inch microwave and wall oven combination features their Vertical Dual-Fan Convection system - perfect for any household. It has a large 5.0 cu. ft. oven capacity with Wi-Fi connectivity and a 7-inch full-color touchscreen display. Their controls show you images of the food to help you select the correct program, doneness levels, and pan types to help you choose the right setting. This is all part of their Culinary Center program that customizes each cooking cycle based on your preferences. Since this iis a convection oven, your convection functions include bake, broil, and roast. durafinish protection keeps it from staining, convection functions include bake, broil, roast. Jenn-Air's 27-inch double wall oven with their MultiMode Convection system has a total capacity of 8.6 cu. ft. The MultiMode Convection system offers three elements to provide consistentheat on every rack and a rapid preheat. With their user-friendly touchscreen controls, you can easily set your cooking preferences, temperatures, and durations. With the My Creations program you can combine up to three cooking modes and settings for your recipes. Without flavor transfer, you can easily position multiple dishes in this oven, especially with their telescoping gliding rack that rolls out for effortless placement of removal of your dishes. Jenn-Air's 30-inch single wall oven with their MultiMode Convection system has a total capacity of 5 cu. ft. The MultiMode Convection system offers three elements to provide consistentheat on every rack and a rapid preheat. With their user-friendly touchscreen controls, you can easily set your cooking preferences, temperatures, and durations. With the My Creations program you can combine up to three cooking modes and settings for your recipes. Without flavor transfer, you can easily position multiple dishes in this oven, especially with their telescoping gliding rack that rolls out for effortless placement of removal of your dishes. Jenn-Air's 30-inch double wall oven with their MultiMode Convection system has a total capacity of 10 cu. ft. The MultiMode Convection system offers three elements to provide consistentheat on every rack and a rapid preheat. With their user-friendly touchscreen controls, you can easily set your cooking preferences, temperatures, and durations. With the My Creations program you can combine up to three cooking modes and settings for your recipes. Without flavor transfer, you can easily position multiple dishes in this oven, especially with their telescoping gliding rack that rolls out for effortless placement of removal of your dishes. Jenn-Air's 30-inch microwave/wall combination features their MultiMode Convection system and has an oven capacity of 5 cu. ft. The MultiMode Convection system offers three elements to provide consistentheat on every rack and a rapid preheat. With their user-friendly touchscreen controls, you can easily set your cooking preferences, temperatures, and durations. With the My Creations program you can combine up to three cooking modes and settings for your recipes. Without flavor transfer, you can easily position multiple dishes in this oven, especially with their telescoping gliding rack that rolls out for effortless placement of removal of your dishes. Jenn-Air's 27-inch microwave/wall combination features their MultiMode Convection system for precise cooking results.The MultiMode Convection system offers three elements to provide consistentheat on every rack and a rapid preheat. With their user-friendly touchscreen controls, you can easily set your cooking preferences, temperatures, and durations. With the My Creations program you can combine up to three cooking modes and settings for your recipes. Without flavor transfer, you can easily position multiple dishes in this oven, especially with their telescoping gliding rack that rolls out for effortless placement of removal of your dishes. 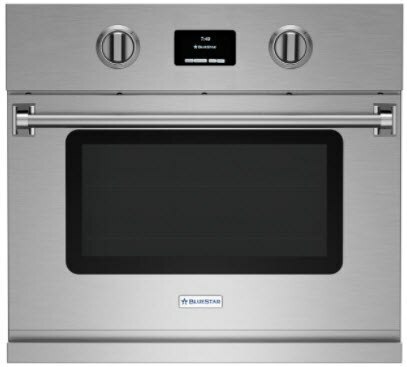 BlueStar's 24-inch single gas wall oven has a powerful 25,000 BTU burner and a 15,000 BTU ceramic infrared burner. For efficiency, this convection oven offers a quick startup and can accommodate a half-size standard commercial cookie sheet, which is typically 18" x 13". To achieve optimal cooking results, this oven has coved corners improving your heat circulation as well as full extension oven racks. This powerful oven is available in natural gas or propane. Lastly, this oven has tons of color options to match your kitchen style and has with a swing door, adjustable to your preference. 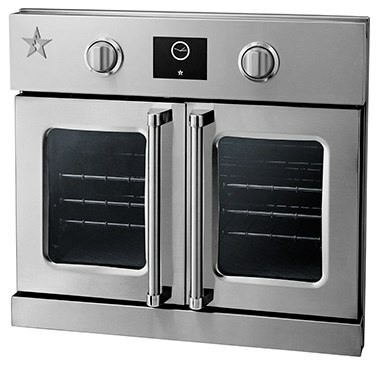 BlueStar's 30-inch single gas wall oven has a powerful 25,000 BTU burner and a 15,000 BTU ceramic infrared burner. For efficiency, this oven offers a quick startup and can accommodate a half-size standard commercial cookie sheet, which is typically 18" x 13". To achieve optimal cooking results, this True Convection oven has coved corners improving your heat circulation as well as full extension oven racks. This powerful oven is available in natural gas or propane. Lastly, this oven has tons of color options to match your kitchen style and has with heavy-duty French Doors for easy loading at any height. BlueStar's 36-inch single french door gas wall oven features European Convection. It has a capacity of 5.04 cu. ft. and posses a commercial grade 1850 degrees infrared broiler for gourmet cooking results. 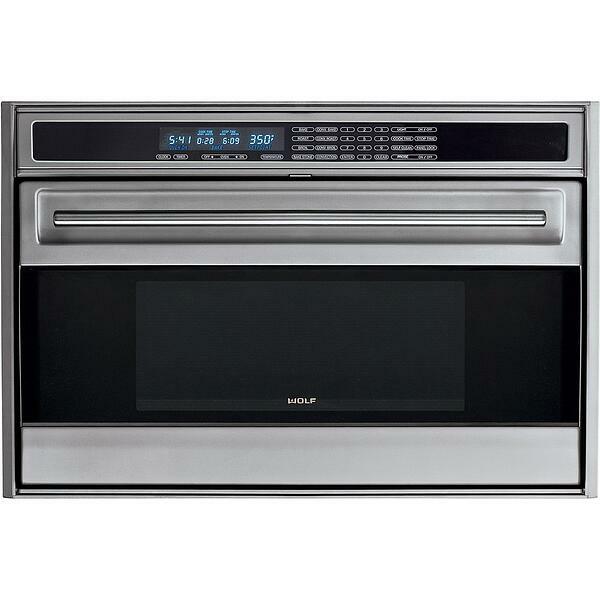 This powerful oven also features a 30,000 BTU burner featuring heat assist for a rapid preheat. This oven can accommodate a full-size commercial cookie sheet (18" x 29") with full extension racks for multiple dish cooking. As for design and controls, this oven features heavy-duty knob control operation. 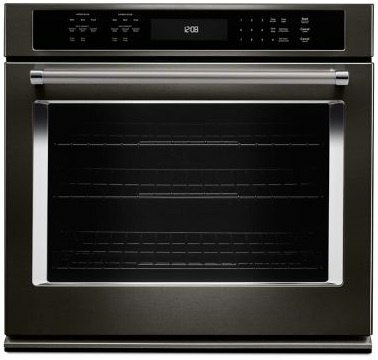 This 30-inch single electric wall oven has a 4.5 cu. ft. capacity with 5 rack positions that can accommodate an 18" x 26" cookie sheet. This convection oven has a commercial grade 5,000-watt infrared broiler, a 2,500-watt bake element, and a 1,500 heat assist for a faster preheat time. With 12 cooking modes and a temperature probe, you can't go wrong. The modes include bake, convection bake, roast, convection roast, broil, stonebake, proof, and Sabbath. As for maintenance, BlueStar's eco-friendly cleaning system, Continu Clean cleans everytime the oven is on without the use of extreme temperatures or fumes. This oven also has an integrated safety control. As for design, you can choose from 750+ color options to perfectly match your unique kitchen. 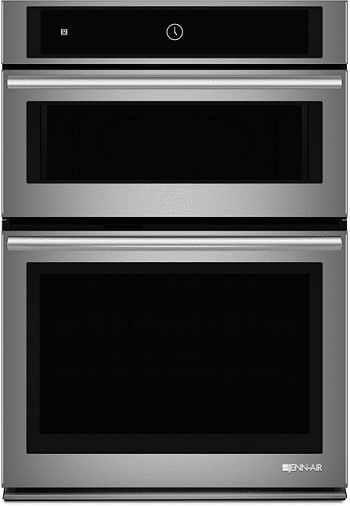 This 30-inch single French Door, electric wall oven will provide you with professional-level performance. At 4.5 cu. ft. oven capacity and 5 rack positions, this oven is meant for multiple dish cooking and can accommodate an 18" x 26" cookie sheet. This convection oven has a commercial grade 5,000-watt infrared broiler, a 2,500-watt bake element, and an 1,800 heat asssit for a faster preheat time. not to mention, it comes with a built-in baking stone and has True European convection. With 12 cooking modes and a temperature probe, you can't go wrong. The modes include bake, convection bake, roast, convection roast, broil, stonebake, proof, and Sabbath. As for maintenance, BlueStar's eco-friendly cleaning system, Continu Clean cleans everytime the oven is on without the use of extreme temperatures or fumes. This oven also has an integrated safety control. As for design, the controls or touchscreen for a seamless look and you can choose from 750+ color options to perfectly match your unique kitchen. BlueStar's 30-inch double electric wall oven will provide you with professional-level performance. At 4.5 cu. ft. oven capacity for each oven and 10 total rack positions, this oven is built to accommodate an 18" x 26" cookie sheet and multiple-dish cooking. This convection oven has a commercial grade 5,000-watt infrared broiler, a 2,500-watt bake element, and an 1,800 heat asssit for a faster preheat time. not to mention, it comes with a built-in baking stone and has True European convection. With 12 cooking modes on the top and 10 on the bottom both with a temperature probe, you can't go wrong. The modes include bake, convection bake, roast, convection roast, broil, stonebake, proof, and Sabbath. As for maintenance, BlueStar's eco-friendly cleaning system, Continu Clean cleans everytime the oven is on without the use of extreme temperatures or fumes. This oven also has an integrated safety control. As for design, the controls or touchscreen for a seamless look and you can choose from 750+ color options to perfectly match your unique kitchen. 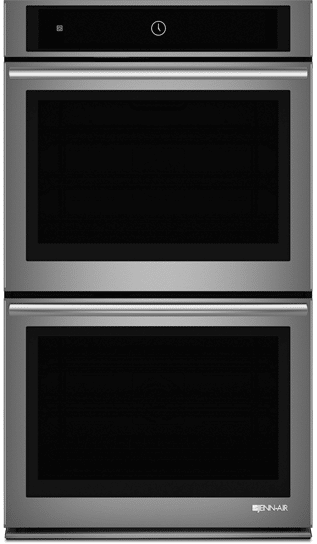 BlueStar's 30-inch double French Door, electric wall oven will provide you with professional-level performance. At 4.5 cu. ft. oven capacity for each oven and 10 total rack positions, this oven is built to accommodate an 18" x 26" cookie sheet and multiple-dish cooking. This convection oven has a commercial grade 5,000-watt infrared broiler, a 2,500-watt bake element, and an 1,800 heat asssit for a faster preheat time. not to mention, it comes with a built-in baking stone and has True European convection. With 12 cooking modes on the top and 10 on the bottom both with a temperature probe, you can't go wrong. The modes include bake, convection bake, roast, convection roast, broil, stonebake, proof, and Sabbath. As for maintenance, BlueStar's eco-friendly cleaning system, Continu Clean cleans everytime the oven is on without the use of extreme temperatures or fumes. This oven also has an integrated safety control. As for design, the controls or touchscreen for a seamless look and you can choose from 750+ color options to perfectly match your unique kitchen. 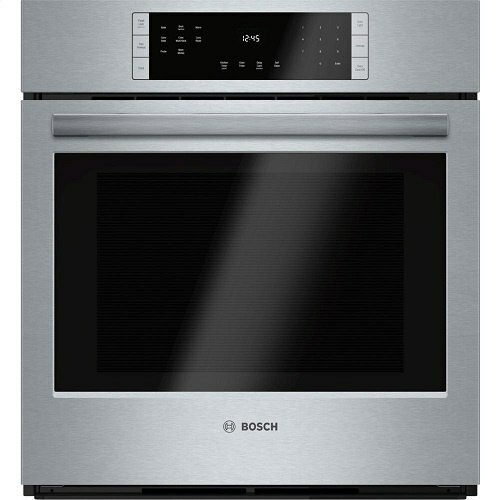 The Bosch 800 series 30-inch single wall oven features Bosch's Quiet Close door, touch controls, and full extension telescopic racks made to make your cooking experience easier. With 12 cooking modes, and a temperature probe to master precision cooking, you can't go wrong. Bosch's custom cooking modes include Proof, Warm, Pizza, and Pie. This convection oven also offers a conversion for convection system so you can convert any of your favorite recipes. The oven's capacity is a good size at 4.6. cu. ft. with a timer, delay start function, and a 2-hour self clean for convenience. its also Star-K Certified. The Bosch 800 series 27-inch single wall oven features Bosch's Quiet Close door, touch controls, and full extension telescopic racks made to make your cooking experience easier. With 12 cooking modes, and a temperature probe to master precision cooking, you can't go wrong. Bosch's custom cooking modes include Proof, Warm, Pizza, and Pie. This convection oven also offers a conversion for convection system so you can convert any of your favorite recipes. The oven's capacity is 3.9 cu. ft. with a timer, delay start function, and a 2-hour self-cleaning mode for convenience. its also Star-K Certified. 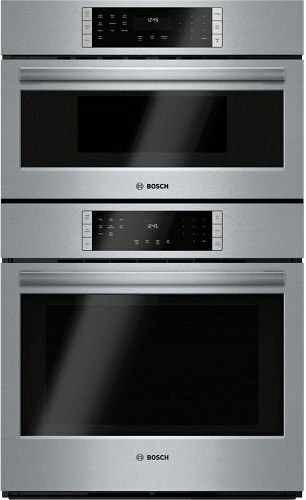 The Bosch Benchmark series 30-inch single wall oven features Bosch's Quiet Close door, touch controls, and full extension telescopic racks made to make your cooking experience easier. With 14 cooking modes, and a temperature probe to master precision cooking, you can't go wrong. Bosch's custom cooking modes include No Preheat, Frozen Food mode, Pizza, Pie, Warm, and Proof. This European convection oven also offers a conversion for convection system so you can convert any of your favorite recipes. The oven's capacity is 4.6 cu. ft. with a timer, delay start function, and a 2-hour self-cleaning mode for convenience. its also Star-K Certified. The Bosch Benchmark series 30-inch single wall oven features a left or right swing door (depending on your preference), full-color touch controls, and full extension telescopic racks made to make your cooking experience easier. With 14 cooking modes, and a temperature probe to master precision cooking, you can't go wrong. Bosch's custom cooking modes include No Preheat, Frozen Food mode, Pizza, Pie, Warm, and Proof. This European convection oven also offers a conversion for convection system so you can convert any of your favorite recipes. The oven's capacity is 4.6 cu. ft. with a timer, delay start function, and a 2-hour self-cleaning mode for convenience. its also Star-K Certified. 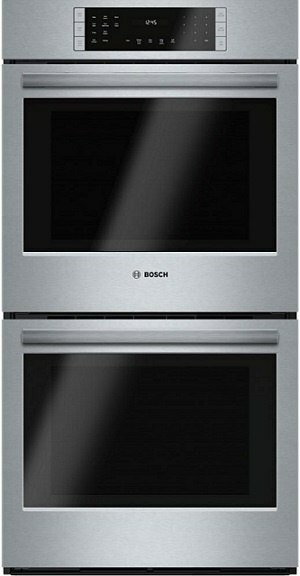 The Bosch 800 series 30-inch double wall oven features Bosch's Quiet Close door, touch controls, and full extension telescopic racks made to make your cooking experience easier. With 12 cooking modes, and a temperature probe to master precision cooking, you can't go wrong. Bosch's custom cooking modes include Proof, Warm, Pizza, and Pie. This convection oven also offers a conversion for convection system so you can convert any of your favorite recipes. Each oven's capacity is a good size at 4.6. cu. ft. with a timer, delay start function, and a 2-hour self clean for convenience. its also Star-K Certified. 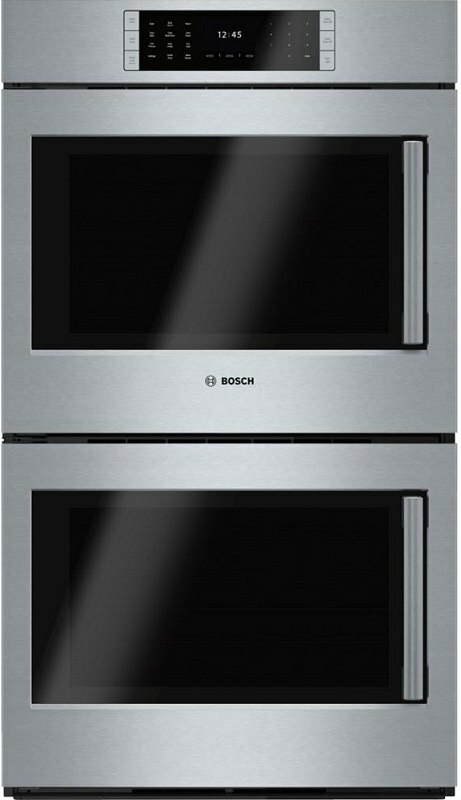 The Bosch 800 series 27-inch double wall oven features Bosch's Quiet Close door, touch controls, and full extension telescopic racks made to make your cooking experience easier. With 12 cooking modes, and a temperature probe to master precision cooking, you can't go wrong. Bosch's custom cooking modes include Proof, Warm, Pizza, and Pie. This convection oven also offers a conversion for convection system so you can convert any of your favorite recipes. Each oven's capacity is 3.9 cu. ft. with a timer, delay start function, and a 2-hour self-cleaning mode for convenience. its also Star-K Certified. The Bosch Benchmark series 30-inch double wall oven features Bosch's Quiet Close door, touch controls, and full extension telescopic racks made to make your cooking experience easier. With 14 cooking modes, and a temperature probe to master precision cooking, you can't go wrong. Bosch's custom cooking modes include No Preheat, Frozen Food mode, Pizza, Pie, Warm, and Proof. This European convection oven also offers a conversion for convection system so you can convert any of your favorite recipes. The oven's capacity is 4.6 cu. ft. with a timer, delay start function, and a 2-hour self-cleaning mode for convenience. its also Star-K Certified. The Bosch Benchmark series 30-inch double wall oven features left or right swing doors (depending on your preference), full-color touch controls, and full extension telescopic racks made to make your cooking experience easier. With 14 cooking modes, and a temperature probe to master precision cooking, you can't go wrong. Bosch's custom cooking modes include No Preheat, Frozen Food mode, Pizza, Pie, Warm, and Proof. This European convection oven also offers a conversion for convection system so you can convert any of your favorite recipes. Each oven's capacity is 4.6 cu. ft. with a timer, delay start function, and a 2-hour self-cleaning mode for convenience. its also Star-K Certified. 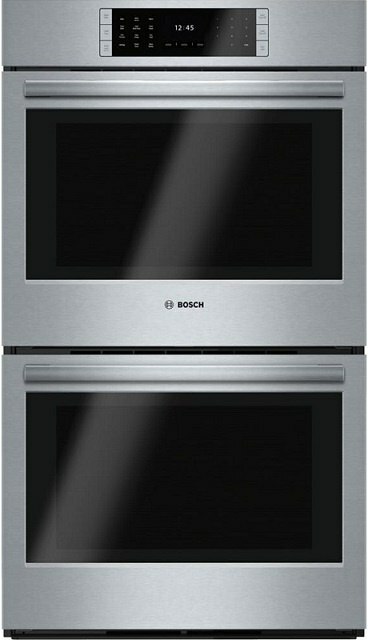 The Bosch 800 series 30-inch microwave combination wall oven has their European convection wall oven. It features a temperature conversion system for convection to input your favorite reipes. The wall oven has a 2- hour self-cleaning mode and is 4.6 cu. ft capacity. The microwave has 10 power levels for reheat any dish or liquid. 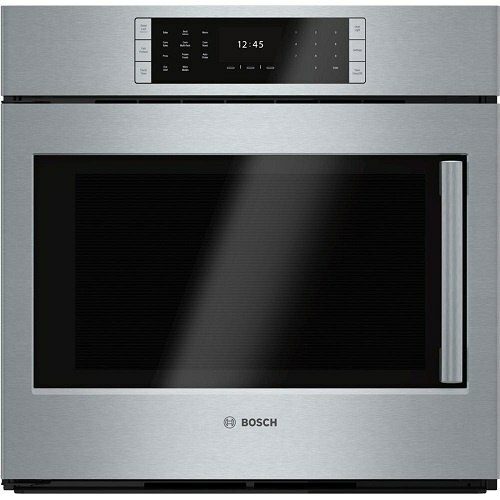 The Bosch Benchmark 30-inch microwave combination oven with convection features a temperature conversion system for convection so you can covert your favorite recipes. This 4.6. cu. ft. capacity oven has full-extension telescopic racks, a meat probe, a fast preheat time, and a timer with a delary start function for easy, convenientcooking. It also has a 2-hour self-cleaning mode. As for the microwave, it has 10 microwave power levels - perfect for reheating any liquid or dish. 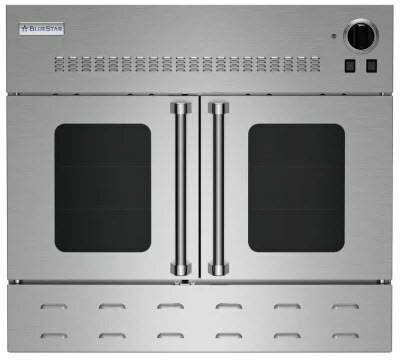 Gaggenau's 400 series 30-inch double wall oven features 17 cooking modes and room to save your favorite recipes - perfect for your gourmet cooking needs. The modes include convection, broiling, dough proofing, defrosting, and keep warm as well as a baking stone operation. You also have a temperature probe to measure for precision and a rotisserie spit. At 4.5 cu. ft. oven capacity for each oven, this oven accommodates five different rack levels each. The racks are self-clean safe made from enamel. Now you won't have to remove the racks to clean the oven. As for design and controls, the controls are touchscreen. 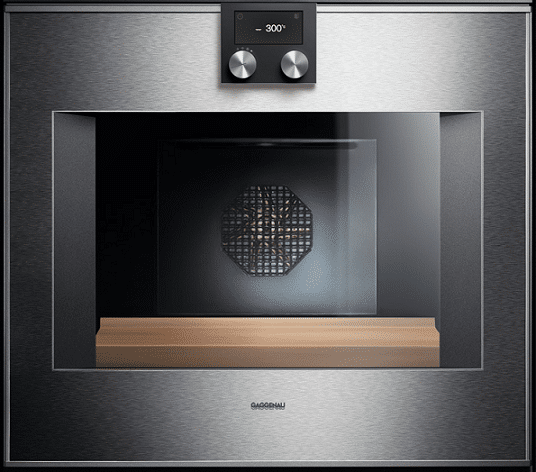 Gaggenau's 400 series 30-inch single wall oven features 17 cooking modes and room to save your favorite recipes - perfect for your gourmet cooking needs. The modes include convection, broiling, dough proofing, defrosting, and keep warm as well as a baking stone operation. You also have a temperature probe to measure for precision and a rotisserie spit. At 4.5 cu. ft. oven capacity, this oven accommodates five different rack levels. The racks are self-clean safe made from enamel. Now you won't have to remove the racks to clean the oven. As for design and controls, the controls are touchscreen. 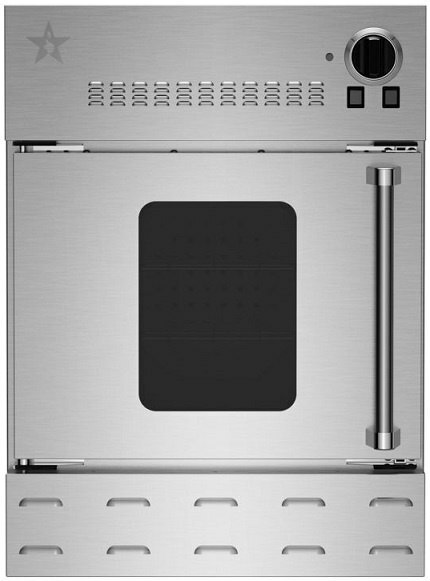 400 series, 24-inch single electric wall oven, 3.2 cu. ft. oven capacity, baking stone operation, self-cleaning, 13 cooking modes such as convection, dough proofing, defrosting, and bake stone operation, automatic door opening, meat probe with automatic shut off, super-quick preheating, self-cleaning. 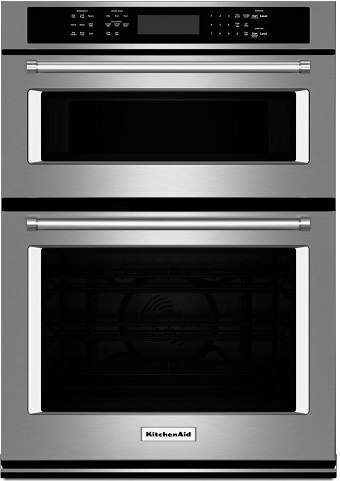 Fisher and Paykel's 30-inch single electric wall oven with convection features 9 cookig modes incuding Bake, Aero Bake (fan with upper outer and lower elements), Broil, Warm, and Roast. The Warm function helps with proofing dough, warming plates, and keeping your food warm when its done cooking. This 4.1 cu. ft capacity oven has 8 possible rack positions and a 5-hour self-clean. 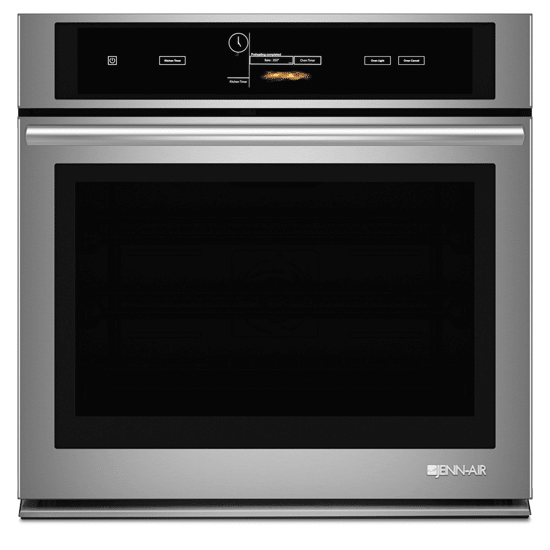 Fisher and Paykel's 30-inch double electric wall oven with convection features 9 cookig modes incuding Bake, Aero Bake (fan with upper outer and lower elements), Broil, Warm, and Roast. The Warm function helps with proofing dough, warming plates, and keeping your food warm when its done cooking. You also have automatic cooking to set ovens to turn on and off. These 4.1 cu. ft capacity ovens have 8 possible rack positions each and a 5-hour self-clean. KitchenAid's 24-inch single wall oven with True Convection has a capacity of 3.1 cu. ft. and features a 13-inch baking stone that releases food easily. It also has an excellent broiling element, great browning foods like salmon. This oven also features KitchenAid's EasyConvect conversion system so you can convert your favorite recipes. Even-Heat Preheat helps to remove any cold spots in the oven so air is circulated better for more even cooking. 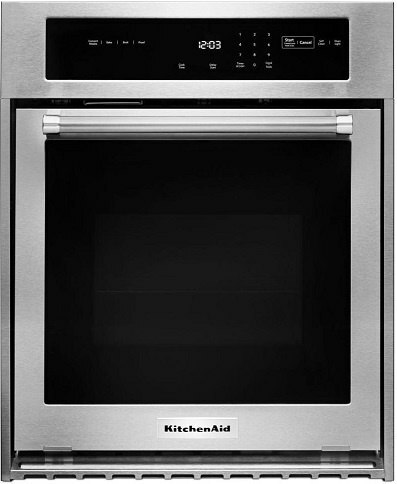 KitchenAid's 27-inch single wall oven with True Convection has a capacity of 4.3 cu. ft. It also has an excellent broiling element, great browning foods like salmon. This oven also features KitchenAid's EasyConvect conversion system so you can convert your favorite recipes. Even-Heat Preheat helps to remove any cold spots in the oven so air is circulated better for more even baking and roasting. As for controls, this oven has a glass-touch display that is very user-friendly. KitchenAid's 30-inch single wall oven with True Convection has a capacity of 5 cu. ft. It also has an excellent broiling element, great browning foods like salmon. This oven also features KitchenAid's EasyConvect conversion system so you can convert your favorite recipes. Even-Heat Preheat helps to remove any cold spots in the oven so air is circulated better for more even baking and roasting. As for controls, this oven has a glass-touch display that is very user-friendly. KitchenAid's 24-inch double wall oven with True Convection has a capacity of 3.1 cu. ft. for each oven. It also has an excellent broiling element, great browning foods like salmon. This oven also features KitchenAid's EasyConvect conversion system so you can convert your favorite recipes. Even-Heat Preheat helps to remove any cold spots in the oven so air is circulated better for more even cooking. 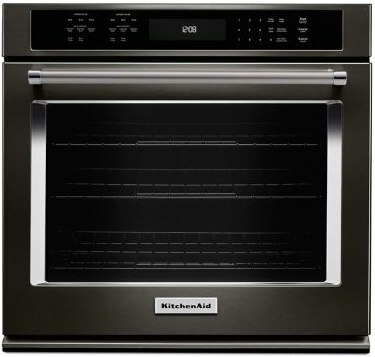 KitchenAid's 27-inch double wall oven with True Convection has a capacity of 4.3 cu. ft for each oven. It also has an excellent broiling element, great browning foods like salmon. This oven also features KitchenAid's EasyConvect conversion system so you can convert your favorite recipes. Even-Heat Preheat helps to remove any cold spots in the oven so air is circulated better for more even baking and roasting. As for controls, this oven has a glass-touch display that is very user-friendly. 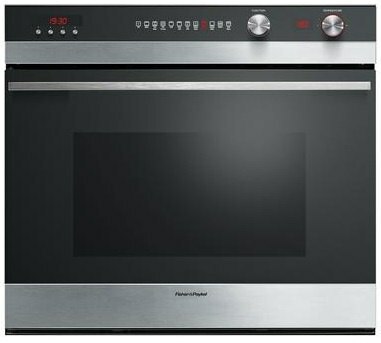 KitchenAid's 30-inch double wall oven with True Convection has a capacity of 5 cu. ft. for each oven and SatinGlide racks. It also has an excellent broiling element, great browning foods like salmon. This oven also features KitchenAid's EasyConvect conversion system so you can convert your favorite recipes. Even-Heat Preheat helps to remove any cold spots in the oven so air is circulated better for more even baking and roasting. As for controls, this oven has a glass-touch display that is very user-friendly. 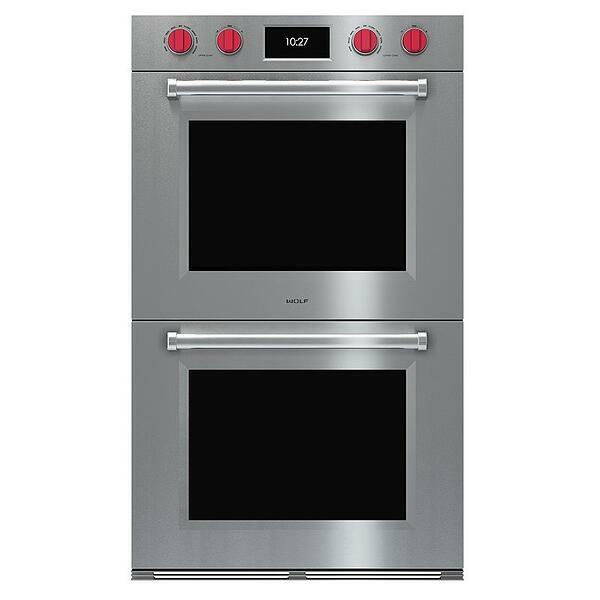 KitchenAid's 27-inch combination wall oven features their Even-Heat, True Convection system in the 4.3 cu. ft. capacity lower oven. The upper oven provides a 1.4 cu. ft. capacity microwave convection oven. The upper oven includes an internal temperature probe and their EasyConvect conversion system for precise results. With SatinGlide racks, this oven makes the placement and removal of dishes easy with roll-out extension. The microwae features a crisper pan for frying, grilling, and convection cooking. 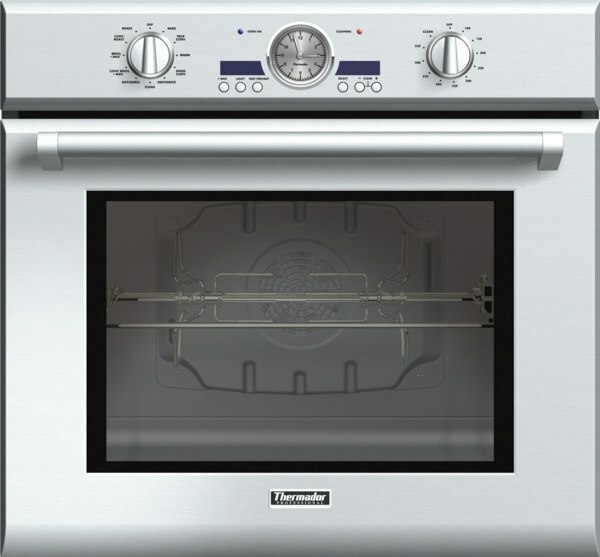 KitchenAid's 30-inch combination wall oven features their Even-Heat, True Convection system in the 5 cu. ft. capacity lower oven. The upper oven provides a 1.4 cu. ft. capacity microwave convection oven. The upper oven includes an internal temperature probe and their EasyConvect conversion system for precise results. With SatinGlide racks, this oven makes the placement and removal of dishes easy with roll-out extension. The microwae features a crisper pan for frying, grilling, and convection cooking. Unfortunately we didn't find any exact matches. 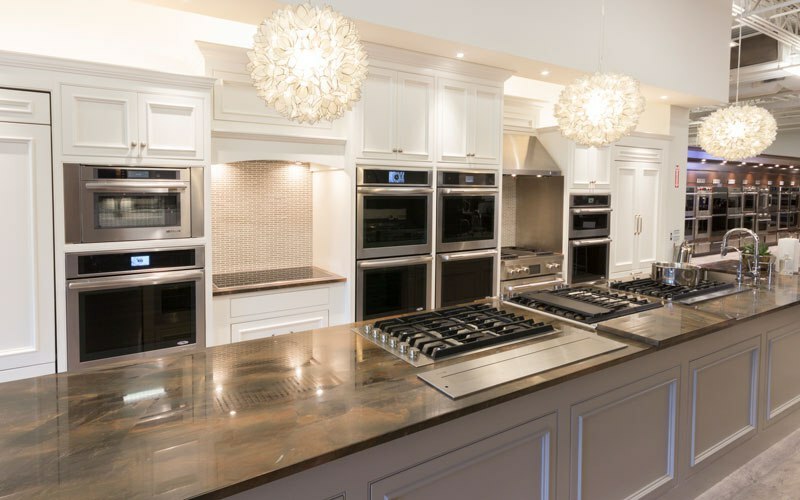 Our team can help you find the perfect wall oven for your home. Use the links below for more info about the top brands to consider or contact us. 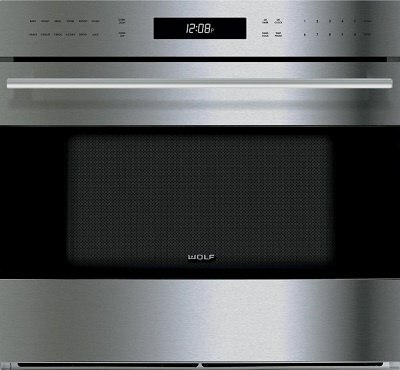 The Wolf E Series is the original twin convection oven. It differs from the others because each fan operates independently to maintain ideal temperature. The M series new blower convection delivers air faster for better baking results. The new Gourmet setting will calculate time and temperature for food as well as best rack position. Miele is the only twin convection oven offering Steam Assist to caramelize meats, harden cheeses and baking breads. 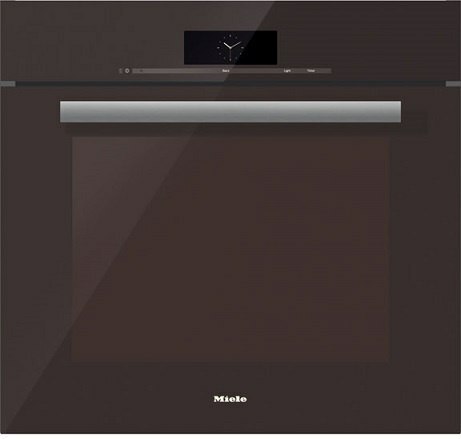 The MasterChef controls will automatically calculate the cooking time and temperature of your meal. 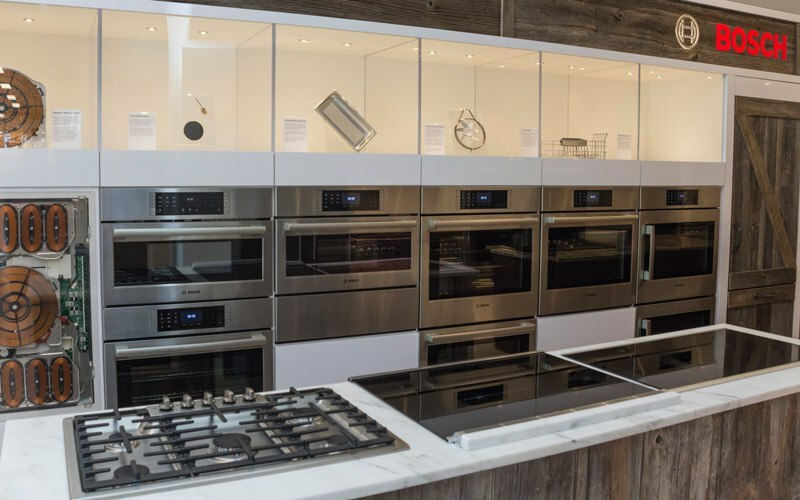 Their Culinary Center is the most intuitive wall oven and can not only show you time and temperature, but will also show you pictures of the cooked food. Jenn-Air is also twin convection and Amazon Alexa compatible. Thermador offers a rotisserie and max broil settings in their better P series ovens. Their M series has electronic controls. BlueStar is known for the commercial French door oven allowing the easiest access to food without reaching over a door. It is available in gas and electric. Gas is the only pure convection on the market and its 18,250 degree broiler is the hottest. KitchenAid was the first with convection conversion and can convert your regular recipes to convection with a touch of a button. Gaggenau was designed by Bang & Olufsen and has the most modern, trendy look. It has the most modes to cook any food precisely. The side-swing door allow easy access to the oven. 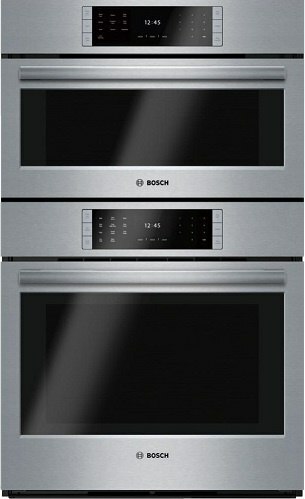 Bosch offers a good looking convection oven available in electronic and manual knob control convection ovens. The Benchmark line has the side-swing door, a commercial look and a digital control center with 14 automatic programs in each oven as well as convection conversion. Fisher & Paykel is a uniquely styled product with 11 different cooking modes from baking to broiling and even a special pastry mode. 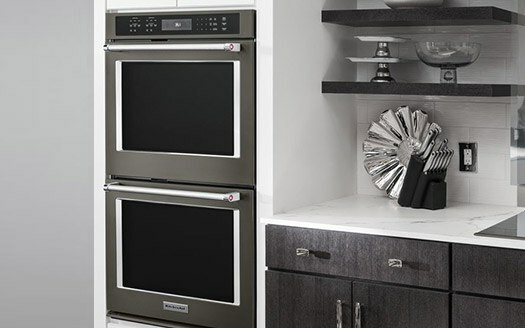 Start here to start learning about wall oven brands, features, and trends. Over 280,000 people have already found answers in a Yale buying guide. Our Wall Oven Buying Guide is the perfect place to start when researching for new appliances. This delivery checklist is designed to better your experience by informing you of what to ask before you buy. Use this free checklist to compare services offered by appliance dealers as you do your research.